A software glitch disrupted services Monday at The Doctors Clinic facilities. TDC President Dr. Randall Moeller said a problem with the operating system installed on the group’s servers prevented staff and physicians from booking appointments or accessing medical records. “It pretty well shut us down,” Moeller said. Moeller stressed the computer issue was not the result of any hacking activity and no patient information was compromised. Many doctors still saw patients Monday and took notes on old-fashioned paper. The Doctors Clinic was operating normally Tuesday. Dr. Peter Lehmann wanted to practice for another 30 years, but he knew he wasn’t going to make it at the pace he was going. The grind of tending to dozens of patients each day took a physical toll on the 52-year-old family doctor, who 10 years ago was diagnosed with a rare adult form of muscular dystrophy. Lehmann needed to find a way to slow down while still making a living. He thinks he’s found a solution in direct primary care, an emerging (or perhaps re-emerging) health care model in which patients pay their provider a flat monthly fee for their care. 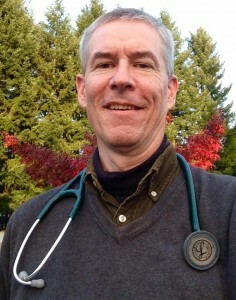 On Jan. 1, Lehmann will leave The Doctors Clinic in Poulsbo, where he’s been a longtime partner, to open his own direct primary care office next door. Lehmann said he’s kept his partners at The Doctors Clinic apprised of his plans and the split will be amicable. Like the Manette Clinic, Lehmann’s patients will pay a flat monthly fee ($50 for adults) to cover their basic primary care needs. There will be no copays and insurance will never be billed. Patients will pay for things like lab work and medications at cost. They will still be encouraged to carry catastrophic insurance plans to cover emergencies. Lehmann currently sees between 2,000 and 2,500 patients. He expects to reduce that number to between 500 and 600 at his new practice. Ideally he’ll see about five to six patients in the office each day, while also providing phone consultations and making old-fashioned house calls. A key premise of direct primary care is that doctors can afford to see fewer patients, and spend more time with each, by ditching the massive overhead costs associated with insurance billing. “That’s the biggest thing that this model offers, you can give patients time,” Lehmann said. Like many devotees, Lehman sees the direct care model as a possible cure for what’s ailing family medicine. Fewer medical students are entering the field because of the high patient volumes being pushed on doctors he said. The pay is also lower than in specialty fields. Lehmann said direct primary care could make the profession more attractive. Dr. Lehmann will hold a town hall-style meeting from 6-8 p.m. Nov. 17 at Poulsbo City Hall to discuss the direct primary care model. The public is welcome.